High quality 100% hand-painted oil art painting on thick high quality canvas to brighten the walls of your home, and relax you after work. Our painter of world-class artisans painstakingly reproduces all of our paintings by hand, using only the museum quality oil paints on canvas. We stand by our top quality and strive to make your favorite paintings as original paintings nature of the artwork. The edges of every canvas paintings are painted and the surface is covered with clear plastic film layer to protect the wall paintings. Canvas painting are wrapped and stretched on durable wooden frame with hooks mounted on each panel for easy hanging out of box. Redefine your living style now with this unique and elegant piece of art paintings created by professional artist. High quality 100% Hand-painted oil paintings on canvas painted by our professional artist with years of oil painting experience. A great gift idea for your relatives and friends. 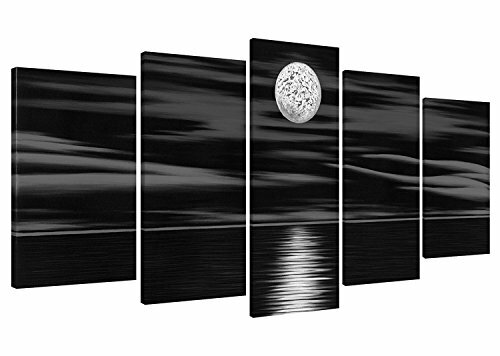 5 piece gallery wrapped black and white decorative ocean sea beach canvas oil paintings wall art set for home decorations wall decor, each panel has a black hook already mounted on the wooden bar for easy hanging out of box. Painting size: 10x16inchx2pcs,8x20inchx2pcs,8x24inchx1pc (25x40cmx2pcs, 20x50cmx2pcs, 20x60cmx1pc). Due to different brand of monitors, actual home art colors may be slightly different from the product image.